Brilliance Audio, 2017. 8 hours, 59 minutes on 8 discs. I got to read a novel for adults! The Newbery committee decided to avoid listening to audiobooks of eligible books, since we don’t want the skill of the readers to influence our opinions one way or the other – so when I drive to and from work, I do not listen to children’s books. 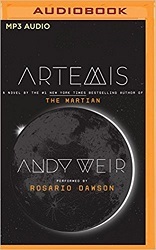 And Artemis is indeed a book for adults – there is plenty of profanity and sexual innuendoes. Jazz Bashara, the main character of this book, is not as likable as the main character of The Martian, the author’s first brilliant book. At least not for me. I’m a rule follower. Jazz is the opposite of that. She’s surviving in her home town on the moon as a smuggler. But then she gets a chance to change that completely, if she’ll pull off a sabotage job for a billionaire. But then something goes wrong, and then the billionaire gets murdered, and to save her own life she ends up planning a much bigger job. Like The Martian, this book is full of suspense and full of authentic details about the technology. Artemis is a city on the moon, built in domes named after the men of the first manned mission to the moon. The book is full of details about how life works on the moon, and the job Jazz needs to pull off can only be done using science. The problems she confronts have to do with science, too. So it’s a book completely different from the author’s first, but it’s also full of life-and-death science scenarios. And I tend to be extremely picky – but it never disrupted my suspension of disbelief even once.